Part II. explains how to extend the BPMN model file and add custom property sections to visual elements. Part III. explains how to extend the custom property section. First verify that BPMN2 plugin is already installed in your Eclipse IDE. I am working with Eclipse Luna and BPMN2 in Version 1.1.1 in this tutorial. Version 1.1.1 of the BPMN Plugin can be installed from here. The BPMN2 Example from Bob Brodt which I used for my own project can be found here. If you are working with Eclipse Luna the plugin development is much easier as in the early years of Eclipse. 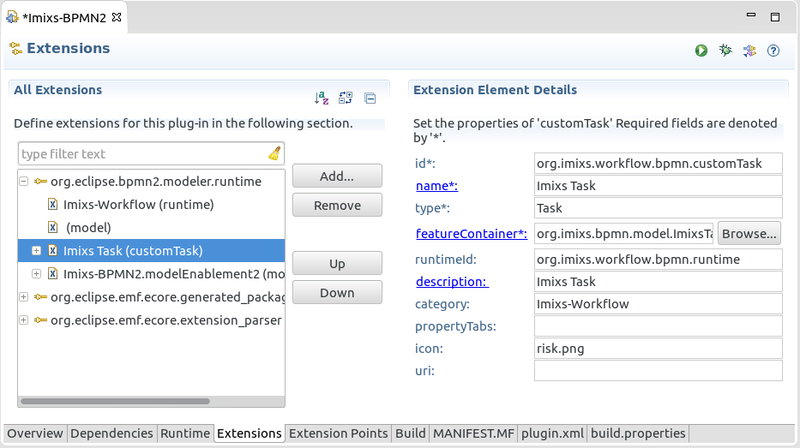 So most things can be controlled from the plugin editor and Eclipse will take care about necessary dependencies to the BPMN2 Plugin . 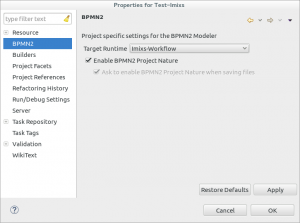 If you install also the BPMN2 Sources you can look around the BPMN 2 implementations which will help sometimes to understand some behavior in the background. Optional you can also import the following plugins into your Eclipse Workspace. First of all create a new Eclipse Plugin project. To extend the BPMN Plugin you first need to add some of the necessary dependencies. 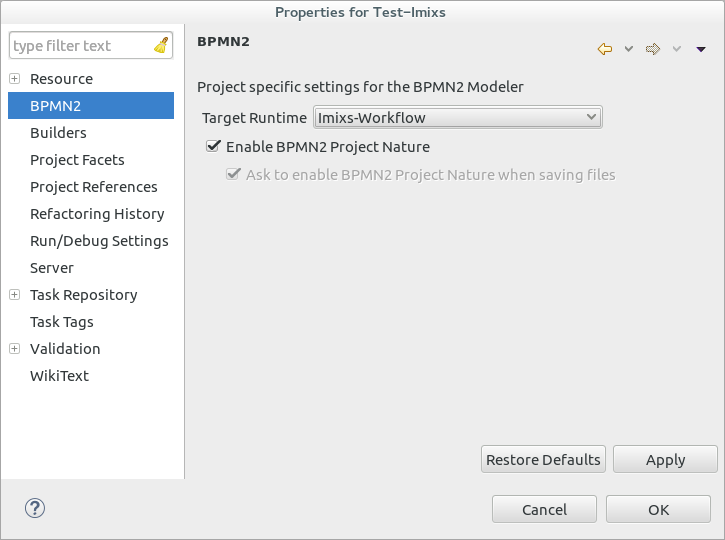 The core element of a BPMN2 Plugin extension is the BPMN2 Runtime Extension. 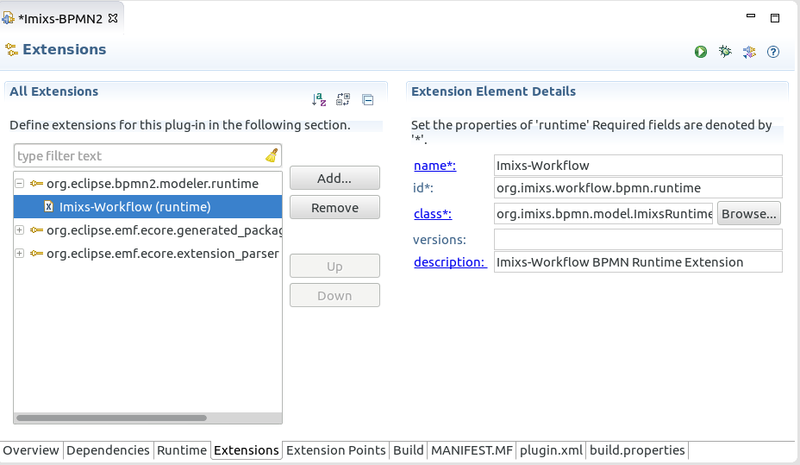 So first of all you need to create a new Class which implements the Interface ‘IBpmn2RuntimeExtension’. In the RuntimeExtension you need to provide a method for letting the editor know if a bpmn model should be handled by this plugin. This can be done by “peeking” at the contents of the file and checking the targetnamespace. If it not match the namespace of my extension, then I return ‘false’. Note that the target namespace test does not have to be the only criterion for determining if the model file should be handled by your plugin. This can be as simple or complex as necessary, but care should be taken here since there my be several other bpmn extensions that will need to perform this same test. After you added your new extension you can start with the configuration of your extension. Click ‘new -> runtime’ to define your runtime Extension. Chose your java class file created before and define a Name and a unique ID. The ID of the runtimeExtension is necessary later! 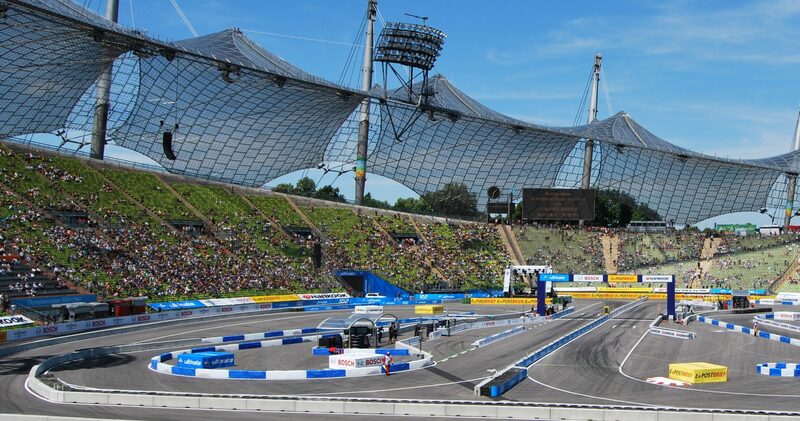 Now you can start a first Test. Just launch your plugin as an Eclipse Application from the plugin.xml Editor. In the testing workspace you can create a new empty project. If you open the properties of your project you should see the section ‘BPMN2’ with a target runtime selector. Here your new RuntimeExtinsion should be listed. 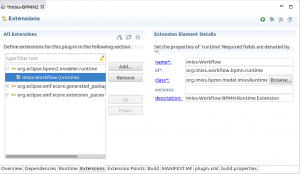 Selecting a runtime extension means that this runtime is used by the BPMN2 Modeler Plugin. You can now add also a BPMN model within you project. Now its time to extend the behavior of your new BPMN Extension. In this tutorial I will explain how to add a new customTask element extending the BPMN task element. To define a new customTask element just open the plugin.xml file and create a new ‘CustomTask’ to your bpmn plugin extension node. In the property ‘runtimeid’ add the previous defined Runtime ID. In the property ‘Type’ enter ‘Task’ to use the standard task object type to be extended from BPMN2. The Property ‘category’ defines a new section in the tool palette where your new element will be available. // This is where we inspect the object to determine what its custom task ID should be. // In this case, the "type" attribute will have a value of "MyTask". // If found, return the CUSTOM_TASK_ID string. // object features. This simple case just demonstrates what needs to happen here. To identify the task element the class should be assigned to, you can add a new property named ‘type’ into the customTask extension point. Use the plugin.xml editor and add a new property to your customTask with the name ‘type’ and the value ‘TestTask’. These values are evaluated from the new TestTaskElementFeatureContainer1 class. You can now also define additional custom properties. These properties will be displayed in the ‘Task’ property Section when you edit the new Task Element with the BPMN Editor. This kind of properties are called ‘dynamic properties’. This is the easiest way to create a custom BPMN element. In part II of this Tutorial I will explain how to extend the BPMN Model and create custom property sections. I am not sure which configuration part has led to this. Any suggestion will be mighty helpful for me in this regard. Cheers! This includes an updated version of this tutorial. 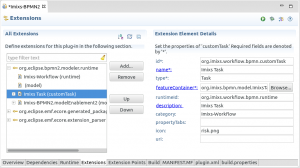 Next PostNext Extending Eclipse BPMN2 Plugin – Part II.